The syllable-square stanza is a poetic form I often turn to when scientific terminology gives me little hope of matching traditional patterns of rhyme or rhythm -- counting syllables gives discipline and invention to my word choices, and these are for me essential in writing poetry. As a grandparent of school-age children I am deeply worried about the world they are inheriting. I want it to offer a healthy environment and safety with vast opportunities for women as well as men. And my own writing often supports these views. I encourage readers to use the blog SEARCH to find an assortment of poems on a theme -- such as "girl" or "environment" or . . . For example, here is a link to postings that include the word opportunity. Scrolling through that list leads to this posting of Eavan Boland's poem, "Code," which honors Grace Murray Hopper. Counting toward Christmas . . .
Like my grandchildren, I am counting the days until Christmas -- enjoying holiday lights that break the winter darkness and looking forward to family gatherings. Below I repeat a growing snowball poem that I first posted at the Christmas season in 2012. Holiday greetings and good wishes to ALL! It's time to correct our answers! at the bottom of the pile? for me to read the good papers first. my proof of the theorem? pick up a pen and write a little rhyme. and the Journal of Humanistic Mathematics for today's poem. SPLIT THIS ROCK -- Poetry that takes a stand! plan to attend Split This Rock's 2018 (April 19-21) Festival. Information about the festival and how to register available here. One of the most vital and persistent forces behind Split This Rock , an organization of socially engaged writers, has been Washington DC poet Sarah Browning -- THANK YOU, SARAH. Here is one of Sarah's poems that presents some of the awful arithmetic of WAR. gives us "The Mathematics of Heartbreak". Here next, in contrast to the BIG poems on YouTube, is a small mathy poem by Howard Nemerov (found here, along with other tiny Nemerov poems). Thanks, Francisco, for alerting me to this treasure. To take the fly, the dewdrop, and the sun’s light. Annie Finch, a poet I have known through WomPo, an online community (founded by her) that supports women-poets. Links to Annie's work in this blog -- which feature items that pay careful attention to syllable-counts -- are here, (for July 29, 1010) and here, (for June 27, 2015). Gary Fincke, who was once almost a neighbor of mine -- I taught mathematics at Bloomsburg (PA) University and he taught and developed a creative writing program at nearby Susquehanna University -- and, before I moved south to the Washington, DC area, Gary and I knew each other through local literary events. It was great fun to hear Gary read not only poetry -- I offer a sample of his mathy work below -- but also short fiction; I came away from the November 11 reading with a copy of his new book of short stories, The Killer's Dog (Elixir Press, 2017), which is a very intriguing collection. Fincke's poetry does not shy from mathematics and "The Butterfly Effect" was posted in this blog back on November 22, 2010. Here, from Fincke's collection, Blood Ties: Working-Class Poems (Time Being Press, 2002) is "Calculating Pi." "Pi has been calculated to 480 million decimal points." Several weeks ago I got an email from science journalist Elena Soto, from Palma de Mallorca, Spain, director of a weekly science supplement for the newspaper El Mundo. Soto told me of her poetry -- recently, Kernlose Winter , a collection containing a number of poems with a scientific theme -- and her blog Establo de Pegaso that offers samplings of science-poetry fare. Soto's poem, "The equation of zebra stripes" -- offered below -- is about morphogenesis (the structural changes that occur as an organism develops). From Kernlose Winter and found also in Soto's blog, the poem is dedicated to codebreaker Alan Turing. I offer first Soto's English translation and, following that, her original Spanish version. Thank you, Elena, for sharing this and the links to more of your work. molds her to the smooth curve of the dunes. What is THE GREATEST EQUATION? Sometimes a poem comes to me with a story -- and such is the case with the poem by Richard Harrison that I offer below. As part of my Google-searching for online sites that contain both "poetry" and "mathematics," I found an article about a new book by Canadian poet Richard Harrison -- and the article included the statement, "Harrison also writes about super heroes, cosplay, spoken word poetry and mathematics." And so I hunted for an email address for Richard Harrison, then wrote asking to learn more of his math-poetry activity. In his reply, he sent me the poem below -- his one-and-only mathy poem -- a poem he derived from material he wrote in response to a request by philosopher Robert Crease for candidates for "the greatest equation." Harrison nominated "1 + 1 = 2" and provided an argument in defense of his nomination -- and part of Harrison's response is offered in the preface for Crease's book, The Great Equations: Breakthroughs in Science from Pythagoras to Heisenberg (W W Norton, 2009). 5. No ancient poem is on the subject of soap bubbles. Answer: All your poems are uninteresting. That the Answer/Conclusion follows using the rules of logic requires some calculations which the interested reader is invited to pursue. A solution (and additional puzzles) may be found here. Found at Poets.org, this poem by Brenda Cárdenas that, like too many others portrays a girl in a can't do-math situation. Another aspect of the poem, however, is its Spanish-language descriptions of Hispanic contributions to mathematics. And, despite my protest, I find this a lovely poem and worth sharing. the loop into plumes of our breath? Mathematics -- vital imagery in SO MANY poems . . . Mathematics not only governs the structure of many poems -- of sonnets and pantoums and villanelles and more -- but mathematical imagery is an increasingly vital ingredient of the content. 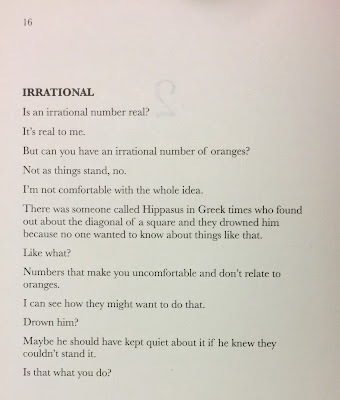 Australian poet and STEAM advocate Erica Jolly has recently alerted me to the most recent issue (Volume 83) of the online journal Cordite Poetry Review -- the theme of this issue: its opening essay, its 60 poems -- is mathematics. Follow this link to Cordite and explore. An important resource for anyone seeking poetry-with-mathematics is the Journal of Humanistic Mathematics -- an online journal in which each biannual issue contains a varied selection of poems. Here is a link to the July 2017 issue for you to explore. The humanistic side of mathematics has been explored for many years by the online British journal plus -- available here. Perhaps you'd like to read an article on "the mathematics of kindness" or survey their articles, videos and podcasts about math-women or read a math-poetry book review -- all this and so much more at plus. with more than 900 postings, much variety is offered. Scroll down OR use the SEARCH box. Explore! A small poem by Lia Purpura in the January 29, 2015 issue of The New Yorker delights even as it highlights the errors that many of us make in supposing that coincidences -- such as meeting some home town friend in a distant vacation spot -- are rare rather than probable. "Poets," said Australian writer and teacher Erica Jolly, "find their themes in what matters to them." This quote is taken from Jennifer Strauss's introduction to Jolly's poetry collection, Making a Stand (Wakefield Press, 2015). Erica Jolly is a retired teacher of history and English in southern Australia and works tirelessly toward ending the segregation between STEM disciplines and the arts and humanities. In the lines below (taken from Making a Stand), Jolly is responding to words from former Chief Scientist Professor Ian Chubb who has said, speaking of mathematics, that he wants "all of us in the same tent." A couple of weeks ago, Irish poet-physicist Iggy McGovern read here in the DC area and introduced readers to his new poetry collection The Eyes of Isaac Newton (Dedalus Press, 2017). McGovern's poems involve a wide variety of scientific topics: vision and color, genetics, quantum theory, and so on -- peopled with scientists and poets -- an amazing variety of topics and verses, scientifically accurate yet accessible to a non-scientist reader. McGovern's poems sometimes turn to humor and below I feature three examples of his clerihew. the first line gives the name of the poem's subject, usually a famous person who at whom fun will be poked. The rhyme scheme is AABB, and the rhymes are often forced. The line length and metre are irregular. subject of The Woman Who Smashed Codes by Jason Fagone (Harper Collins, 2017). and, alas, no one knows her. Of God to play dice." 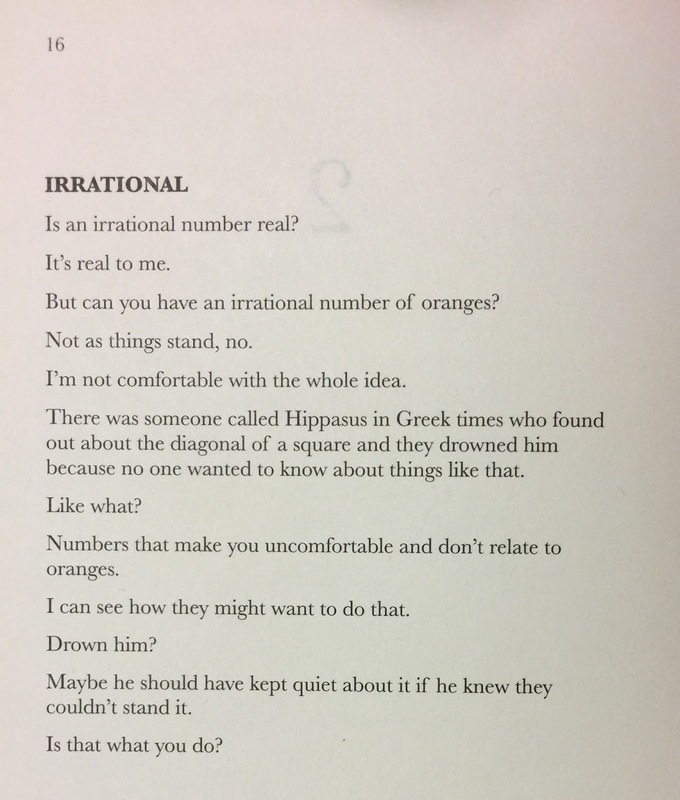 Mathematician Sarah Glaz has recently published a lovely and varied collection of math-linked poetry -- choosing her title, "Ode to Numbers," to echo Pablo Neruda. That Neruda poem is one that Glaz and I have long-loved -- it is included in our anthology, Strange Attractors: Poems of Love and Mathematics (AK Peters/CRC Press, 2008). Glaz's poetry takes a reader to childhood days in Romania, to mathematics conferences, to a variety of topics in the history of mathematics, and to the inner workings of a beautifully creative mathematical mind. One of my personal favorites among poetic forms is the pantoum -- I love the way that permuted repetition of phrases offers surprising new meanings -- and Glaz's collection offers several of these. Earlier in this blog (at this link) I posted "A Pantoum for the Power of Theorems" and below, with permission, I offer "Mathematical Modeling." The best words in the best order . . .
Perhaps the way to link this couplet by Richard Wilbur (1921-2017) to mathematics is by referring to the notion of subset. Wilbur is a favorite poet of mine, and he recently has died. An ape feels natural in the word trapeze. I found these lines at PoetryFoundation.org and they are included in Wilbur's collection of illustrated wordplay, The Pig in the Spigot (Voyager Books, 2004). Wilbur has been mentioned previously in this blog -- to explore, you may use the SEARCH box in the right column or follow this link. The double dactyl is, like the limerick, a fixed verse form -- and one that is often humorous. From Wikipedia's, we have this initial requirement: "There must be two stanzas, each comprising three lines of dactylic dimeter ( ¯ ˘ ˘ ¯ ˘ ˘ ) followed by a line consisting of just a choriamb ( ¯ ˘ ˘ ¯ ) . . ." As the samples below illustrate, a double dactyl involves both nonsense and multi-syllabic words -- a non-trivial challenge; visit Wikipedia to learn more. The verses below are by Arthur Seiken, Emeritus Professor at Union College and I found them (with the help of editor Marjorie Senechal) in a 1995 issue of The Mathematical Intelligencer (Vol 17, No 2, p 11). If you want to see more of this poetic form, here are links to follow: "Mathematical Double Dactyls" by Tristan Miller from the July 2015 issue of the Journal of Humanistic Mathematics and the Higgeldy Piggeldy verse collection of Robin Pemantle. And, again, here is a Wikipedia link that supplies formal details of these verses.